WA Feed In Tariff Info: What you need to know before buying solar. Those in regional areas of WA have Horizon Power as their electricity provider and their feed-in tariffs range from 7.14 cents to more than 51 cents per kilowatt-hour, depending on location. These feed-in tariffs are only available for solar power systems with inverters of 5 kilowatts capacity or less, and only in areas where the maximum permitted amount of rooftop solar that exports electricity to the grid has not already been installed. West Australians who applied for rooftop solar panels from the 1st of July 2010 till the 30 of June 2011 could lock in a 40 cent feed-in tariff for 10 years and those who applied in July 2011 could lock in 20 cents for 10 years. If a system’s solar inverter size is increased, the high high feed-in tariff will be lost. It is possible to increase the panel capacity, but this must be approved by the electricity retailer and the panel capacity must be within 133% of the inverter capacity. If you are going to upgrade your solar power system and you are on the 20c or 40c FiT, then be careful. 1) Your inverter capacity is greater than your existing panel capacity and you want to add more panels. 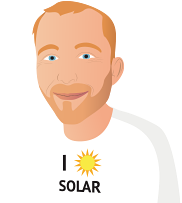 As long as your installers “application to connect” used your inverter size and not your panel array size, then you can add solar panels up to the inverter size (in kW) without losing your feed in tariff rate. However, please be aware that your installer must apply to your energy retailer for approval before any work is done to avoid being in breach of contract with your retailer. 2) You want to add a bigger inverter and add panels. Sorry – if you do this, you will lose your existing FiT and be placed on the miserly 7.135c per kWh. 3) You want add a second solar system next to your existing one. Sorry – if you do this you will lose your existing solar feed in tariff and be placed on the 7.135c per kWh rate. If you are considering an upgrade, I have written a detailed post about how to upgrade your solar power system without getting stung. The WA government’s official solar feed in tariff information is here.